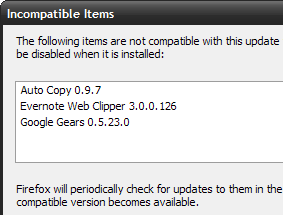 The official release of Firefox’s latest version 3.5 is available for download by the non-beta-testing public today. The folks at Mozilla Add-ons do a great job of nudging their extension authors to make their work compatible with new versions. Still, a few add-ons aren’t there yet, notably Google Gears (not hosted at Mozilla Add-ons) and Tab Mix Plus. Update: Testers tell me a developer build of Tab Mix Plus is Firefox 3.5 compatible. Thanks all! Here are a few others my Twitter followers are missing. Firefox 3.5 to drop tomorrow, yay! Testers, which of your most beloved add-ons aren’t compatible yet? StephanieBamBam said, “Firebug!!! Everything else I use has been updated, it’s wacky to me that firebug still doesn’t work.” Editor: Firebug got updated! MrMileage said, “Better GReader, GoogleAdvCookieOptOut, Drag&Drop.io, Google Gears” Editor: Better GReader is compatible! Thanks to everyone who replied. Hereâ€™s more on why and how Iâ€™m using Twitter to run surveys like this. Isn’t Google Gears kinda obsolete with 3.5’s location awareness and html5? I noticed that Evernote has been updated and is compatible with 3.5 Also, if the extension ever stops working, you can use the equally amazing web clipper bookmarklet. Gears also enables you to save your web work so that you can still access it offline. Google Docs and Remember the Milk both do that I know. @Jacob I think that is also possible with html5. Forces incompatible to work even if they’re not all the way up to date. Of course it could easily break some add ons, but in my experience everything has worked fine. Some offline caching is possible with HTML5, true, however Google would have to support it – i.e. rewrite Gmail to take advantage of the caching capability. It’s also likely that there’s more to Google Gears than merely providing a local cache, so Google is likely to continue to develop Gears regardless of if/when they start supporting HTML5 caching. As for today’s release, I’m always stunned when hugely popular extensions don’t update prior to official releases. How long since the first beta was released, a few months? I know it’s been at least a week for the RC. Often, it’s just a matter of increasing the max version (though that doesn’t necessarily apply to Gears). Regardless, they should have been prepared. I remember upgrading to Vista about a month before the official consumer launch, and Nvidia still didn’t have working drivers for my graphics card. It was infuriating, because Vista had already shipped to businesses 2 months prior, and Vista was RTM months before that (and Beta for who knows how long). Nvidia was totally unprepared, despite about 6 months of Beta or better code to test against. I also just thought of this. During the Google Wave demo, they drug pictures from their desktop directly into the wave. One of the developers mentioned that that one feature is the only action that required Gears and everything else is just HTML5. So that’s also something that HTML5 can’t do that Gears can.